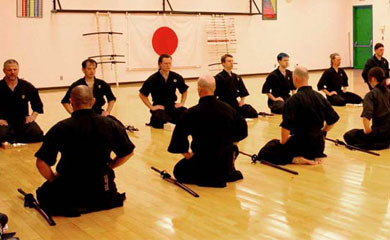 The last class of the year for kenjutsu will be Friday, December 19th. We will start back in the new year with our first class being on Friday, January 9th. After that we will resume the same Tuesday and Friday schedule. The last Kenjutsu class for the year will be Friday, December 20th. Training will resume on Wednesday, January 8th 2014. Starting at the beginning of October, our training schedule will be Wednesday and Friday evening, with no Monday class. For students who have Monday as their regular training day, please talk to Andrew about switching to another class. This will be in effect starting the first Monday of October, the 1st. class on Friday, and no longer need to arrive at the earlier time to tie bundles.